Forthbank has never been a happy hunting ground for Annan Athletic but on this occasion they must have left the ground wondering how they managed to come away pointless after Stirling managed to secure all the points to make it six wins out of the seven league fixtures to keep the Binos top of the league, five points ahead of nearest rivals Peterhead. Annan boss Peter Murphy made one change from the team which shared the points with Stenhousemuir, recent signing Scott Roberts was given the nod ahead of Brandon Luke, Stirling boss Dave Mackay made a couple of changes to his team with on loan Ross County keeper Mark Fodden starting in place of Cammy Binnie and Sean Dickson replacing the injured Liam Caddis on the bench. Annan started the match brightly with Aidan Smith testing Fodden in the 6th minute but the Binos keeper had no chance minutes later when Owen Moxon picked up a Scott Roberts pass and finshed with a superb 20 yard screamer into the top corner of the net. Annan’s joy was short lived when they conceded a goal which had a bit of good fortune associated with it afrer the ball got stuck between Swinglehurst’s legs and Peter Macdonald pounced on the loose ball to set up Darren Smith who’s 15 yard shot cannoned off the underside of the cross bar and into the net to give Atkinson no chance. It was a cruel blow to Annan who were appealing for offside but the goal gave the home team a lift. Ryan Sinnamon made a superb run collecting the ball in his own penalty area and driving forward into the Stirling penalty area to finish with a good effort just wide of the target. Annan continued to take the game to Stirling and Aidan Smith’s decision to shoot when picking the ball up outside the box was foolhardy with the more lucrative options being at either side of the striker. Stirling went ahead in the 30th minute, again there was a slice of good fortune associated with the incident when Annan keeper Jim Atkinson’s clearance cannoned off an Annan defender and Darren Smith’s decision to leave the ball for Callumn Morrison paid off when Morrison correctly defied the offside rule to finish with the simple chance of shooting the ball into the empty net to give Stirling an undeserved half time lead. Annan started the second half well and in the 54th minute a slick move down the left opened up the Stirling defence with Aidan Smith squaring to the unmarked Rabin Omar who totally miskicked with only the keeper to beat. It was a promising start to the half and Annan continued to press forward, Rabin Omar blasted over the bar following a corner on the right in the 57th minute. Annan were finally rewarded for their efforts in the 62nd minute when Smith and Omar combined with Foden pulling off a fine save to deny Omar but Aidan Smith pounced on the rebound to lash the ball into the roof of the net to make it 2-2. Annan were very much on the ascendancy after this with shots from Moxon and Omar failing to hit the target. It was however the home team who had the final say in the 74th minute when Annan got exposed down the left and substitute Neil McLaughlin played the ball out wide to the right to the opposite flank to the feet of Callumn Morrison who had the space to drive the ball into the net giving Atkinson no chance. The defeat leaves Annan perilously close to the foot of the table but the signs look promising that Peter Murphy has the makings of a team who should soon be climbing the league. There was absolutely nothing between the teams but the high flying Stirling have the momentum going for them at the moment and on another day Annan would have taken something from this game. It was a day when Peterhead strengthened their position near the top with a convincing 3-0 victory over Edinburgh City. Stenhousemuir’s 3-0 home victory over Berwick Rangers keeps them near the top of the table and Elgin bounced back from their defeat the previous week with a convincing 3-0 victory over Montrose. Clyde conceded a late penalty with Cowdenbeath scoring to earn a 1-1 draw. Next week Annan entertain Cowdenbeath a team sitting 2 points below them for what even this early on looks like a match Annan will be looking desperately to win to keep some distance between the two teams. STIRLING ALBION – Marc Fodden, Ross McGeachie, Lee Hamilton, Ean McNeil, Ross Smith, Andrew Balack, Callumn Morrison, Peter McDonald (Ross Kavanagh 67 min), Darren Smith, William Robertson (Neil McLauchlin 67 min), Sean Dickson ( Connor McMullan 85 min). Substitutes not used: Cammie Binnie – GK, Scott Davidson, Steven Noble. 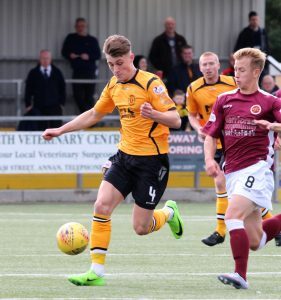 ANNAN ATHLETIC – Jim Atkinson, Scott Hooper,Jack Brannan, Owen Moxon, Peter Watson, Steven Swinglehurst, Dan Orsi ( Scott Roberts HT) , Ryan Sinnamon, Aidan Smith ( John Cunningham 89 min), Rabine Omar, Brandon Luke (Blair Henderson 65 min). Substitutes not used Alex Mitchell (gk), Ellis Pearson, Peter Murphy, James Creaney. Referee –Scott Millar, Assistants Stephen Mitchell and Tony Fullerton .